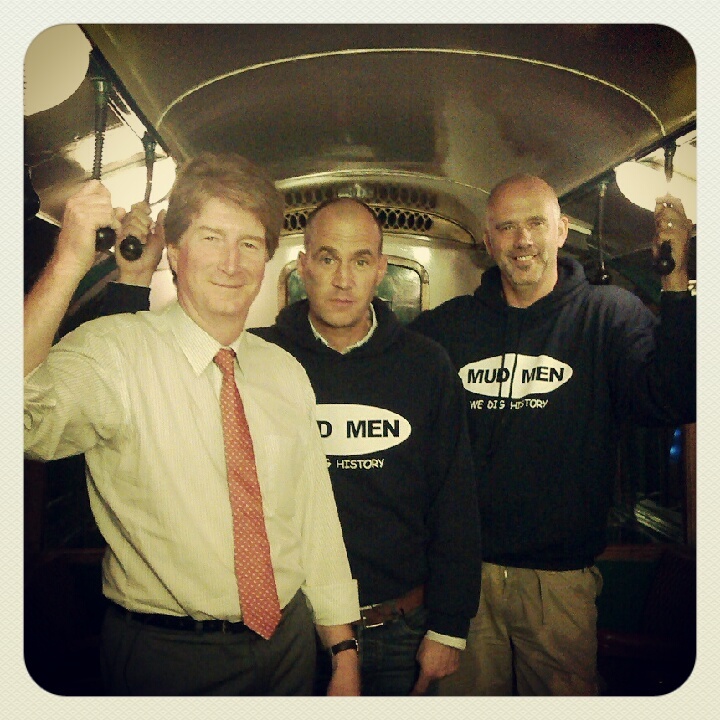 The Mud Men (DJ and presenter Johnny Vaughan, and Mudlarker Steve Brooker – known by admirers as the Mud God) came to film at the Museum last Friday. They were featuring the history of the underground and so they interviewed me on our 1938 Tube Stock. They covered an awful lot in a very short space of time and asked some interesting questions covering a broad range of topics relating to London’s underground. These included how it was financed and developed through to Metro-land and whether any monsters were found during construction of the tunnels! I expect a lot of the footage will hit the cutting room floor but it was interesting to get their take on things – Johnny said that they were exploring ‘the evolution of the everyday’; don’t know if that one will make the final cut. Johnny said that he loves the New Johnston typeface and also that he thought the scale of the vision for the underground was incredible. They both wore Mud Men hoodies with the strapline ‘We dig history’. Their style is pretty light-hearted, very relaxed and fun. I got my own back when I told them that the strap hangers were used by the SAS during the war as coshes. It’s an urban myth but I think they fell for it; it remains to be seen whether or not they include it or edit it out. The show will be broadcast in January 2013 – the 150th anniversary month of the London Underground.